With a population of about 20,000, Svaneti is one of the largest mountain regions in Caucasus, Georgia. It is often referred to as the Land of Towers and Golden Fleece and attracts the attention of world travelers with its unique architectural, ethnographical heritage, landscapes, mountain peaks and glaciers. Svaneti is divided into two parts–Upper Svaneti and Lower Svaneti–and its residents are called Svans. Mestia is a regional center and urban settlement of Upper Svaneti–a starting point for alpinists and mountain climbers. But it is also home to 31-year-old Tinatin Gvarliani and 43-year-old Otar Paliani, members of a not-so-traditional Heifer project there. Tinatin shares about times when the family’s only monthly income was Nunu’s pension, about $50, barely enough to feed his children. “Even when the Heifer staff visited our area, I could not believe it was real and that my life was about to change in such a better way,” Otar says. Tinatin and Otar are part of the Improving Conditions for Ecotourism in the Svaneti Region project. This project promotes ecotourism using the locally popular horse trekking activities for tourists and by working with local governments to provide the best infrastructure to maintain the activities. So it is still a Heifer project with animals, but the use and goal of the project looks a little different from most–promoting ecotourism. Mestia has become one of the most popular winter resorts in Georgia, third only to Bakuriani and Gudauri. The entire town was refurbished and even received a new ski lift. Roads have been repaired and city workers now have resources to fix roads and trails when rockslides block sections of the passageways. While the tourist season only lasts for six months each year, maintaining the industry provides year-round work and income for locals. “Our family is not the only one that was helped by Heifer,” Tinatin says. 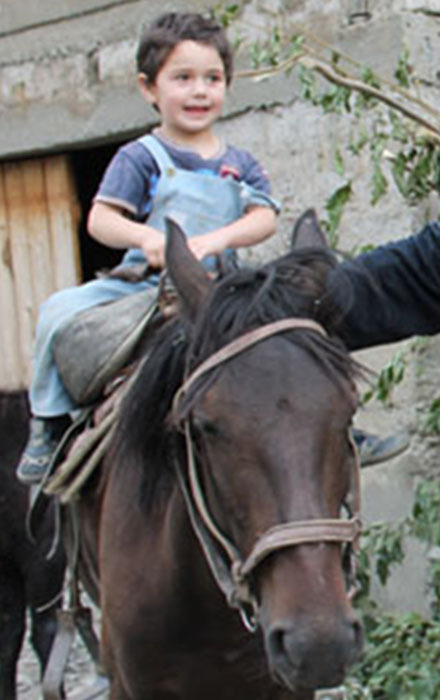 “We’ve been able to Pass on the Gift of horses and training to another family. I know that many others are excited and ready to receive animals, as well. Previous Article What's Award Winning and Available Now? World Ark Tablet Edition!